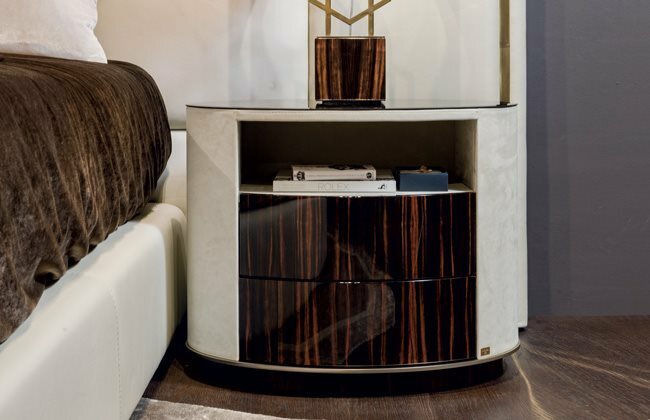 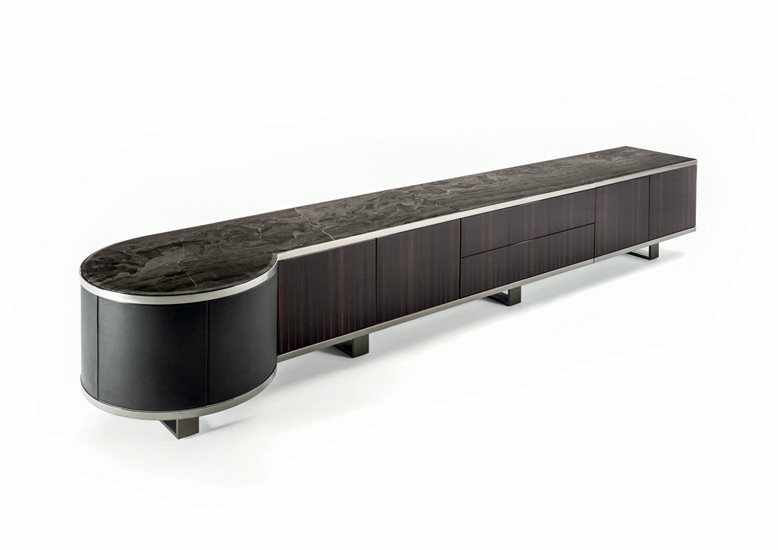 Wall-mounted showcase unit, with wood structure in the finishes: - Glossy/matt ebony, - Glossy/matt Sucupira Luxury, - Glossy walnut burl wood. 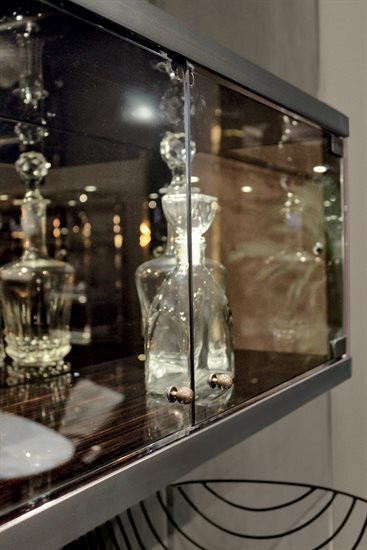 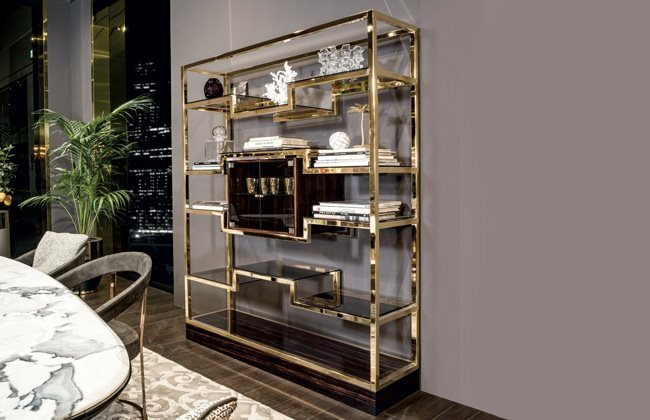 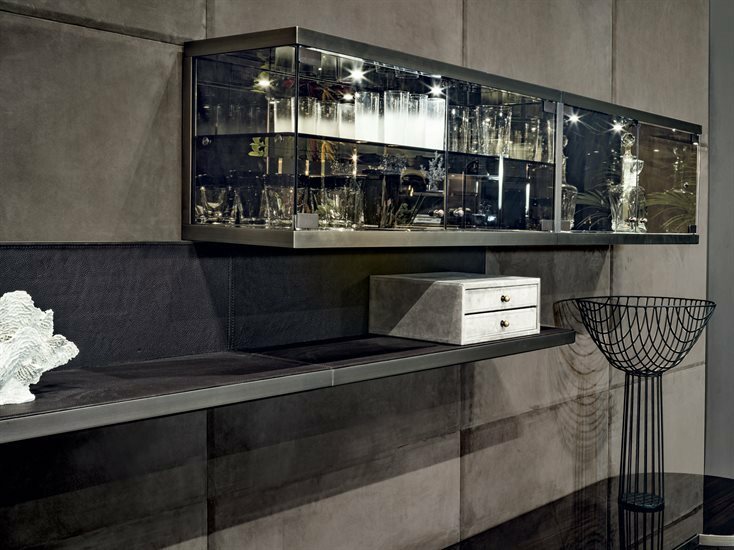 With sides and doors in bronze or smoky tempered glass, and a central shelf in 8 mm tempered transparent glass. 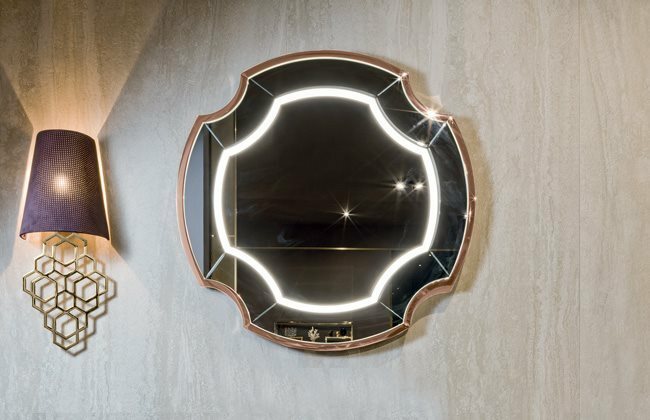 Internal lighting with small LED spotlights and doors opened with small metal knobs. 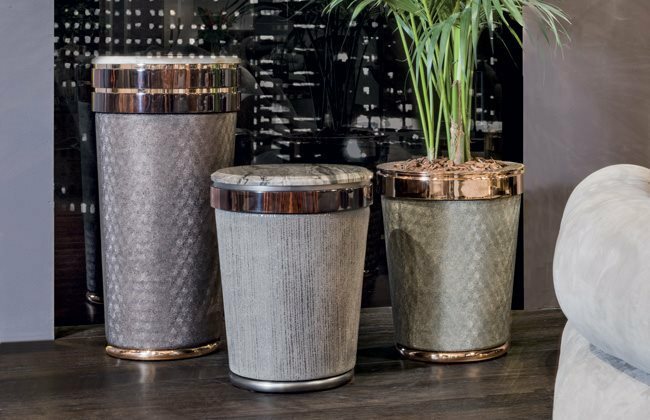 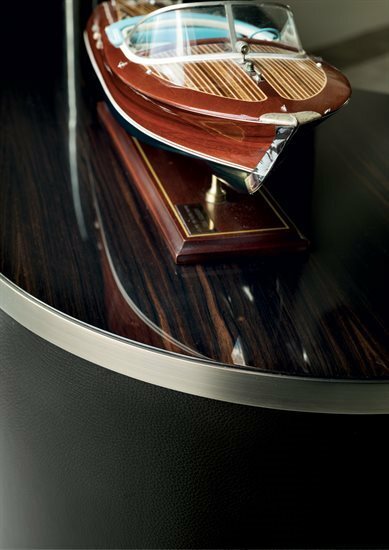 Ground metal edges in the following finishes: - bright pink gold, - matt pink gold, - bright light gold, - matt Champagne gold, - bright chrome, - bright black chrome, - matt satined bronze. 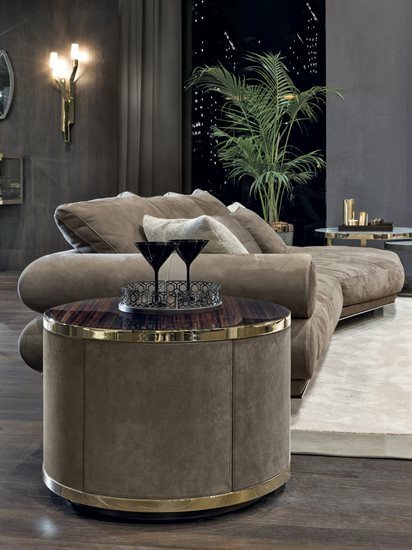 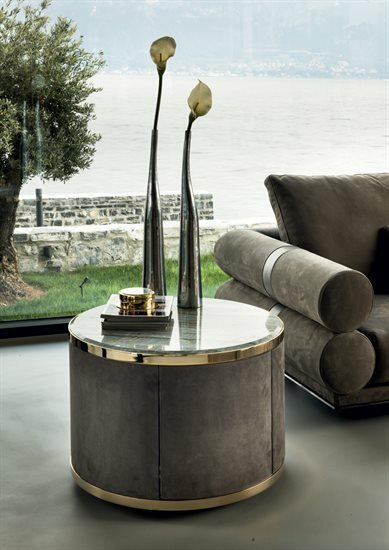 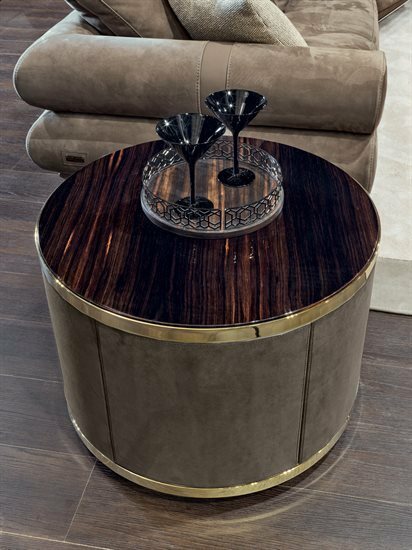 Round bar table with structure upholstered in leather from the range. 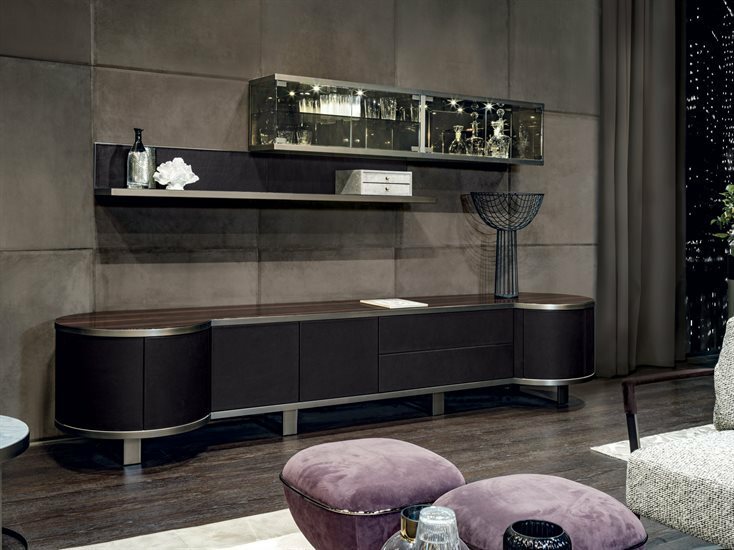 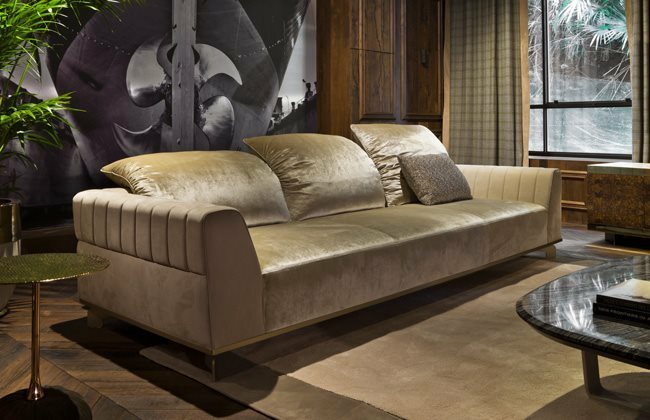 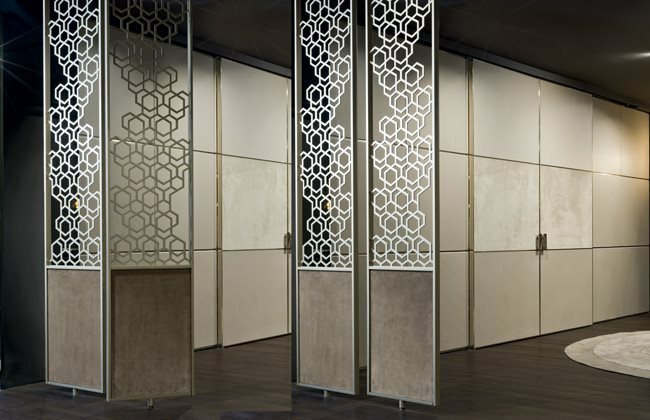 Doors with push-pull openings and interiors lacquered in glossy powder colour. 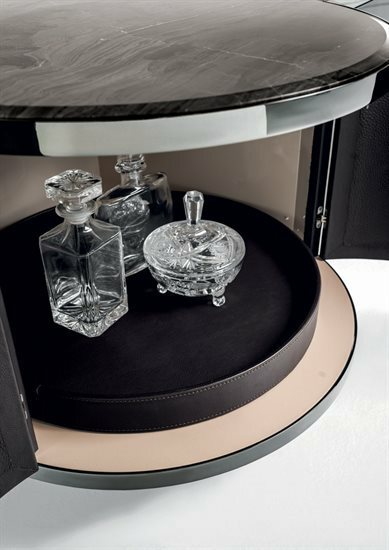 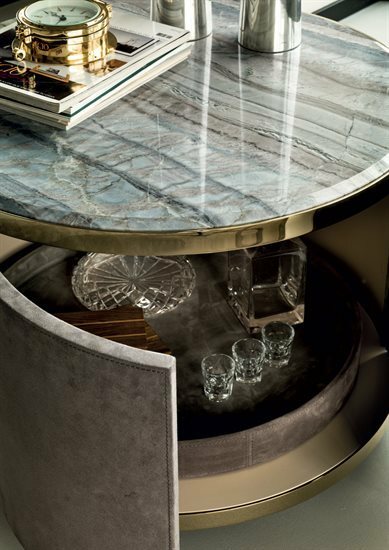 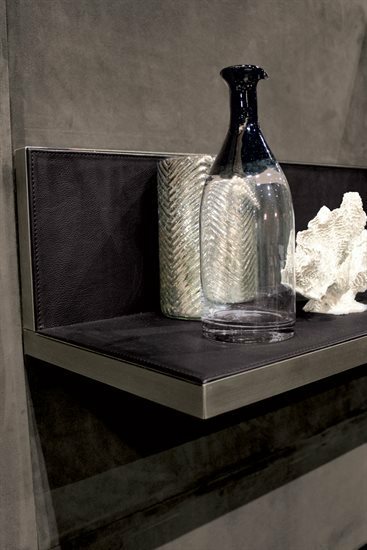 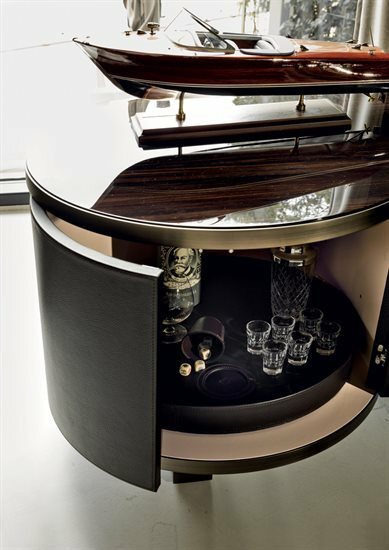 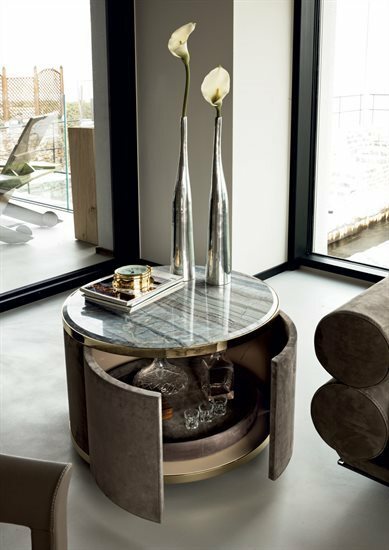 Inside, the table has a rotating bottle holder tray covered in leather from the range (matched with the structure). 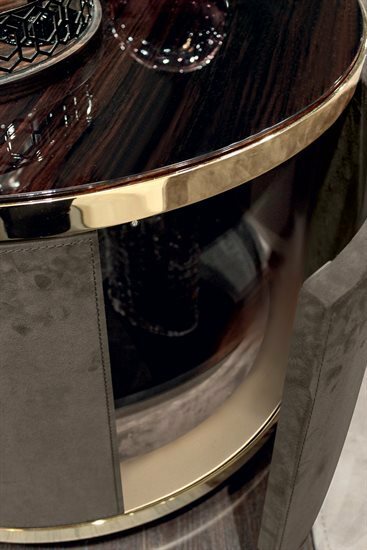 Ground metal edges in the following finishes: - bright pink gold, - matt pink gold, - bright light gold, - matt Champagne gold, - bright chrome, - bright black chrome, - matt satined bronze. 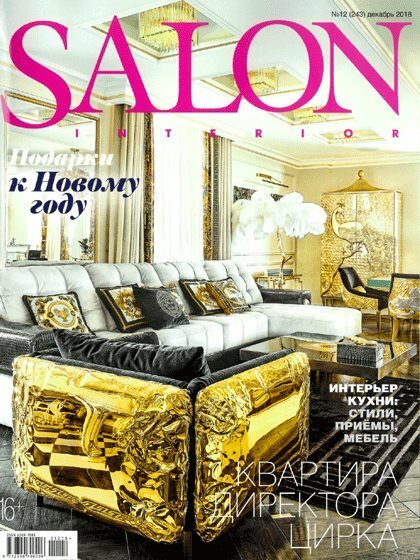 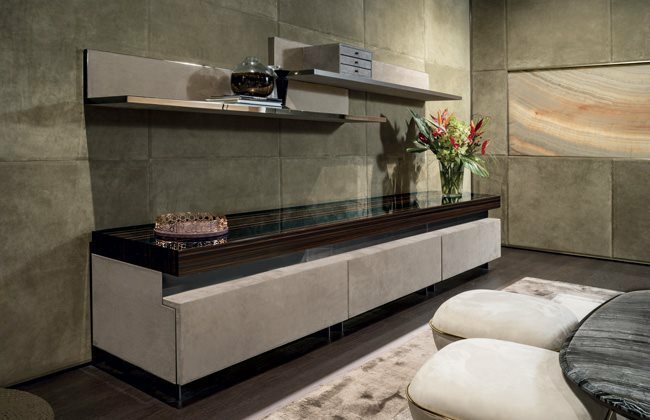 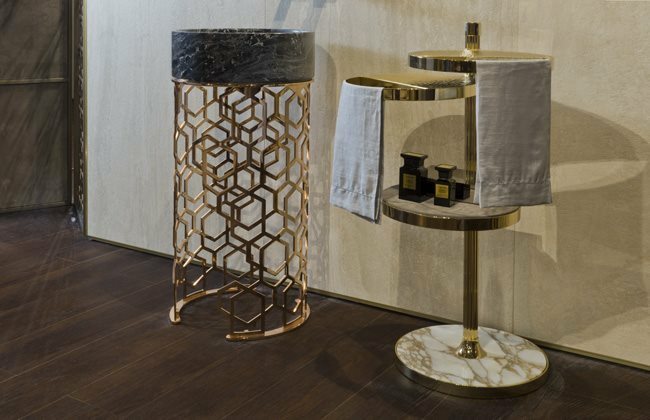 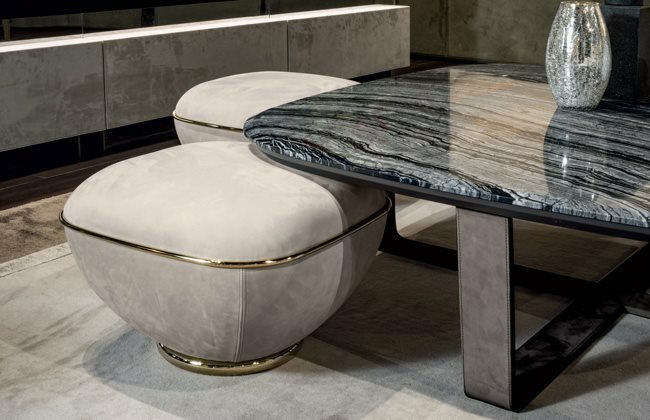 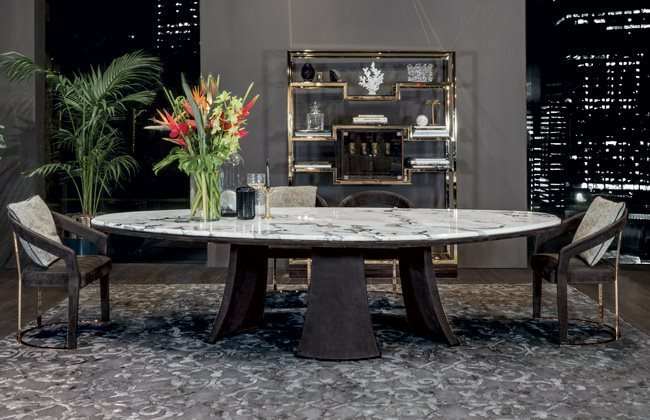 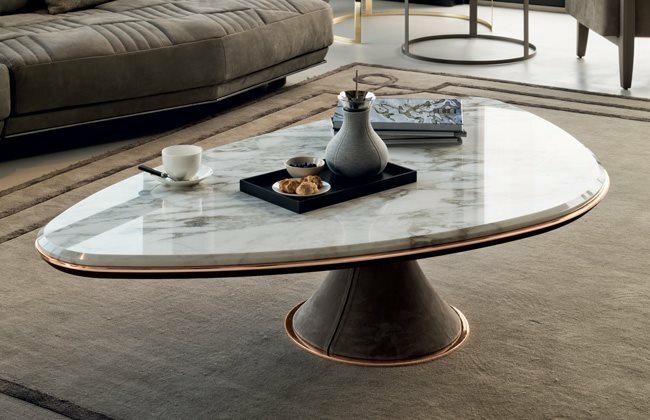 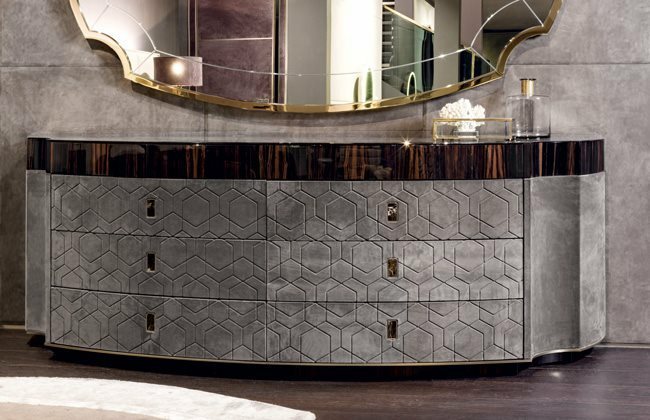 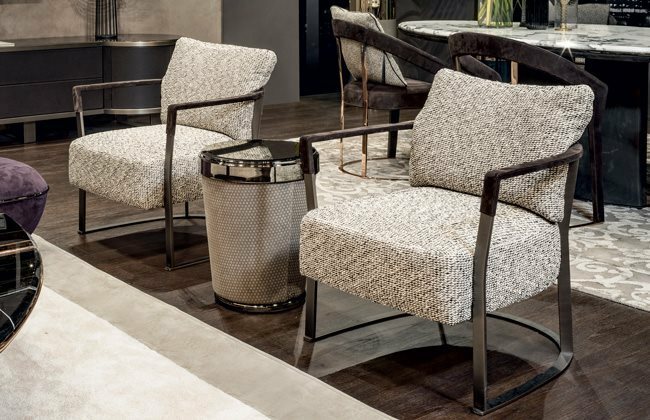 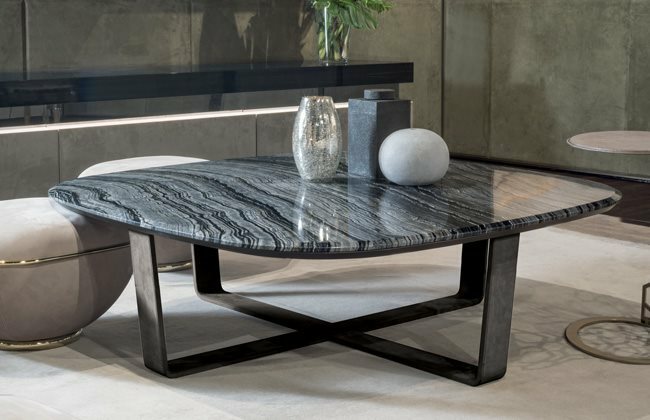 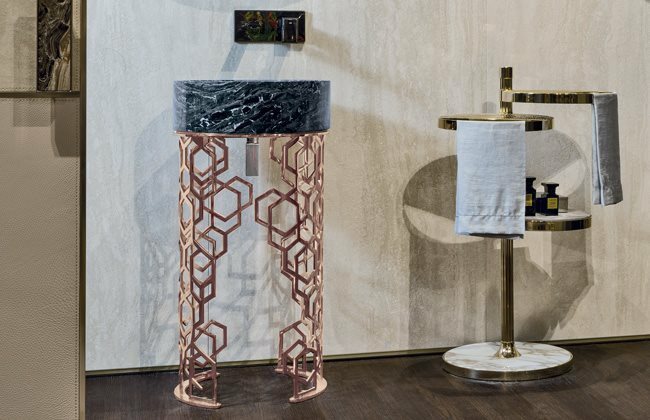 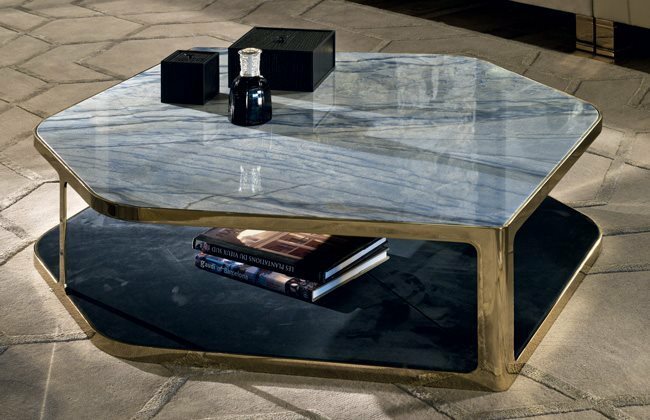 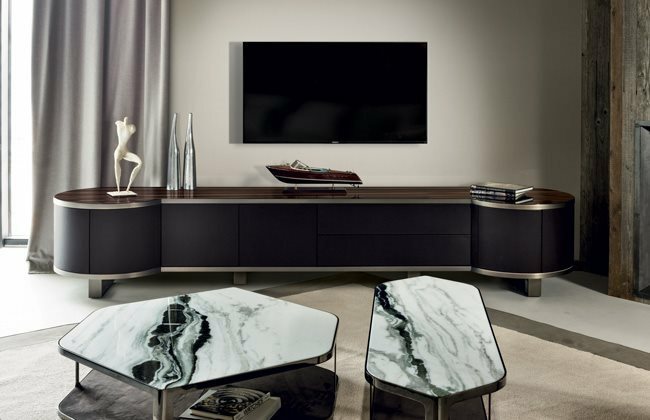 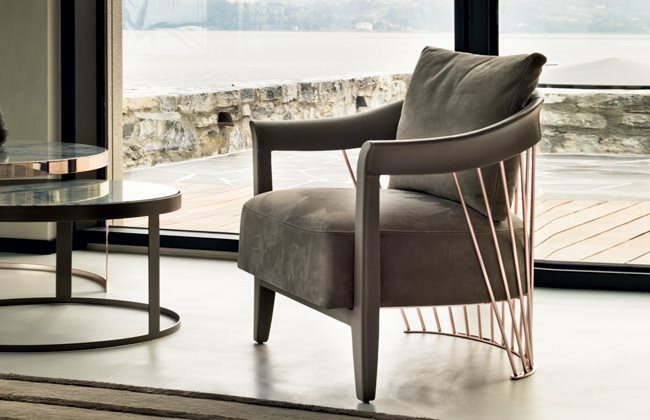 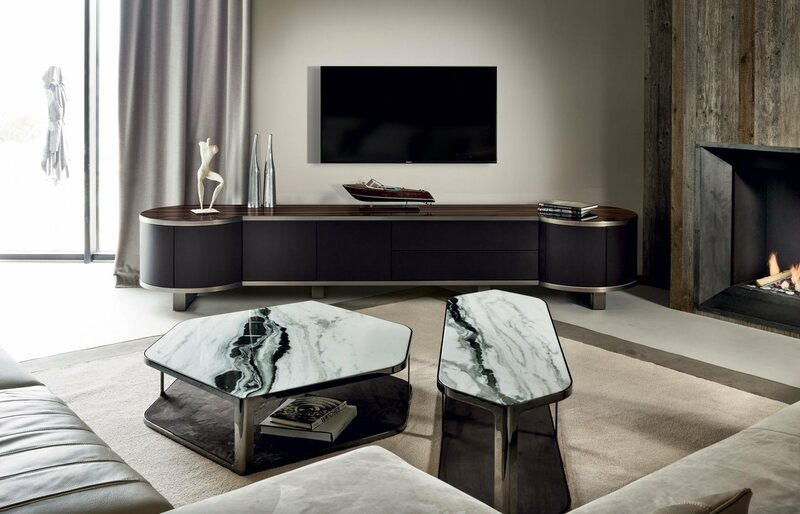 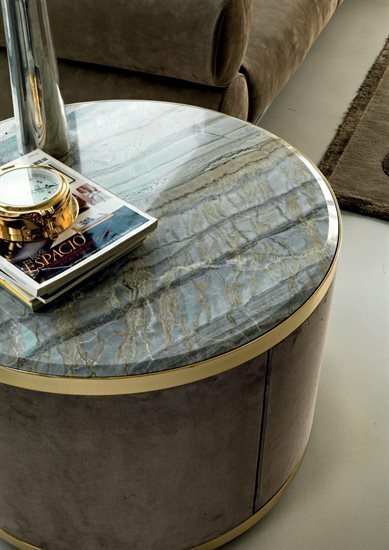 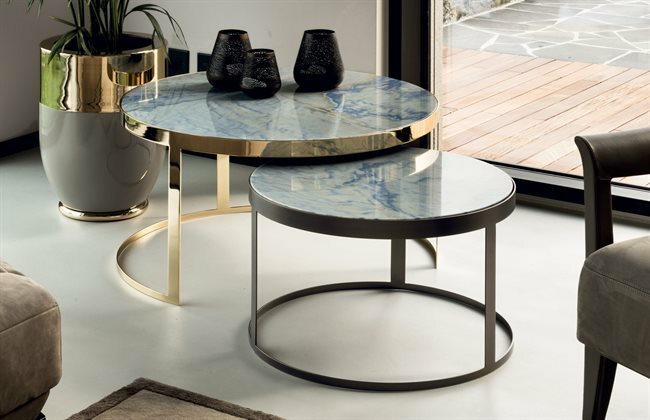 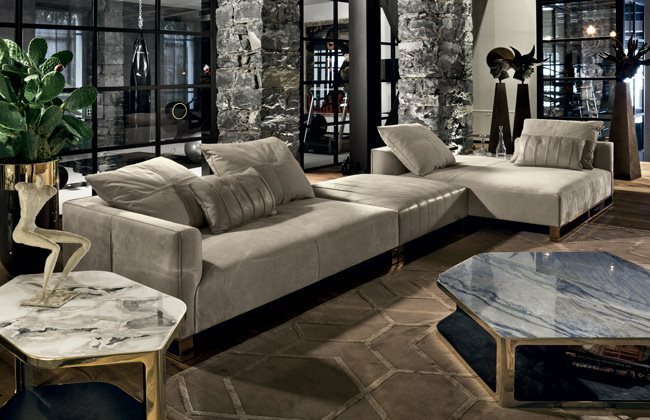 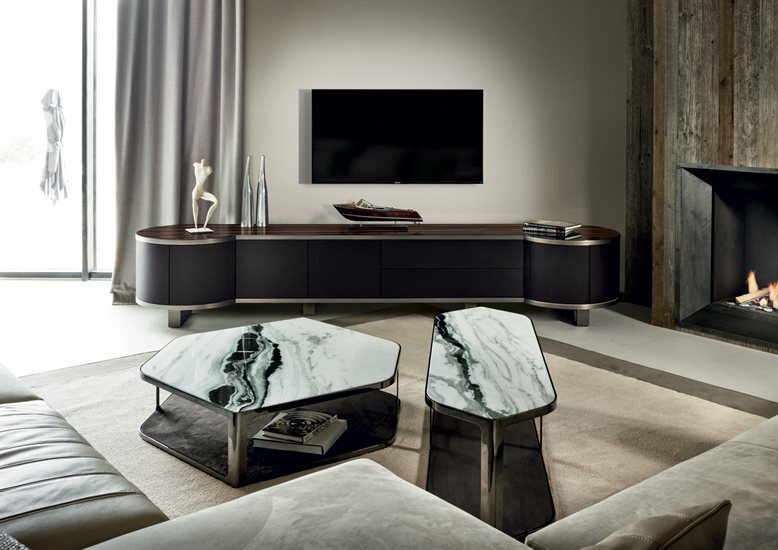 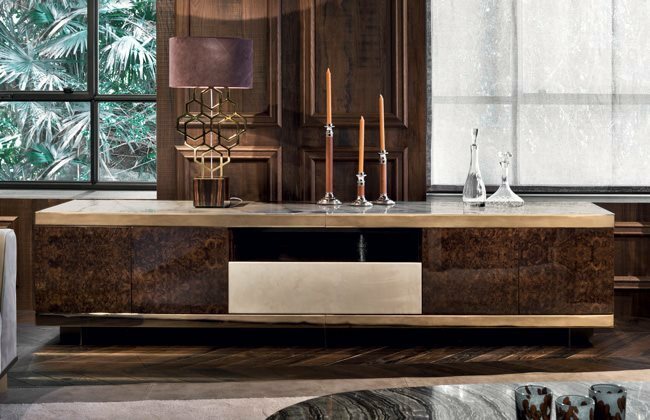 Top finishes: - bronze or smoky mirror, - Azul Macauba marble, - Sahara Noir marble (polyester finish), - Dover White marble, - Panda White marble, - Guatemala Green marble, - Corteccia marble, - Port Saint Laurent marble, - Red Levanto marble, - Bardiglio Nuvolato marble, - Elegant Brown marble, - Shale Rosewood marble, - Emperador Dark marble, - Silver Wave marble, - Agatha Black marble, - Frappuccino marble, - Calacatta Gold marble. 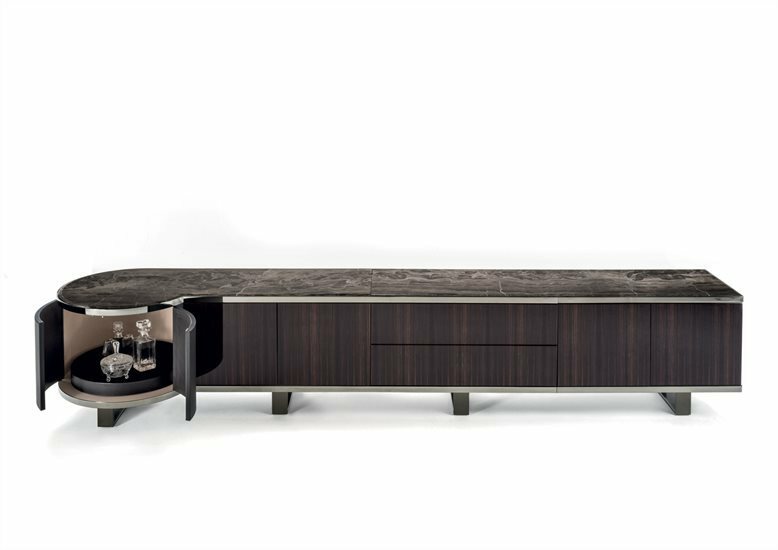 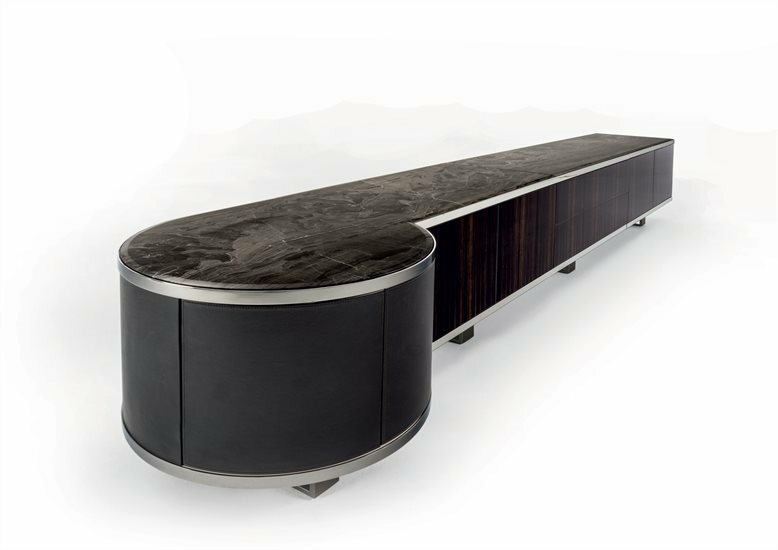 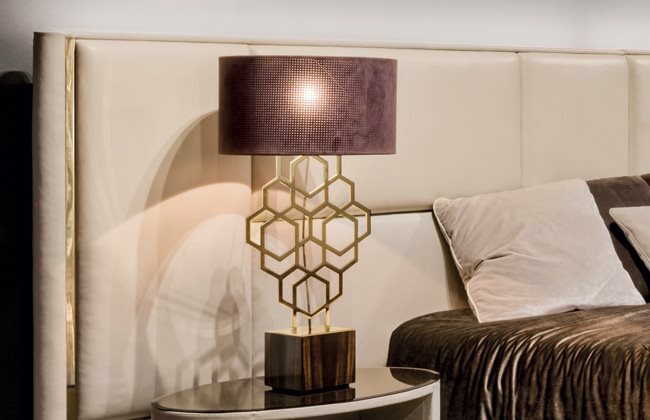 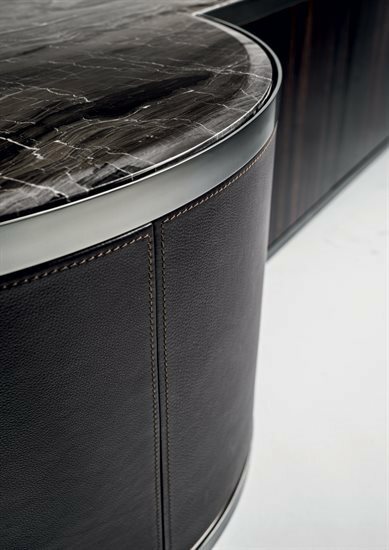 Or in wood in the finishes: - Glossy/matt Ebony, - glossy/matt Sucupira Luxury, - glossy Walnut Burl Wood.